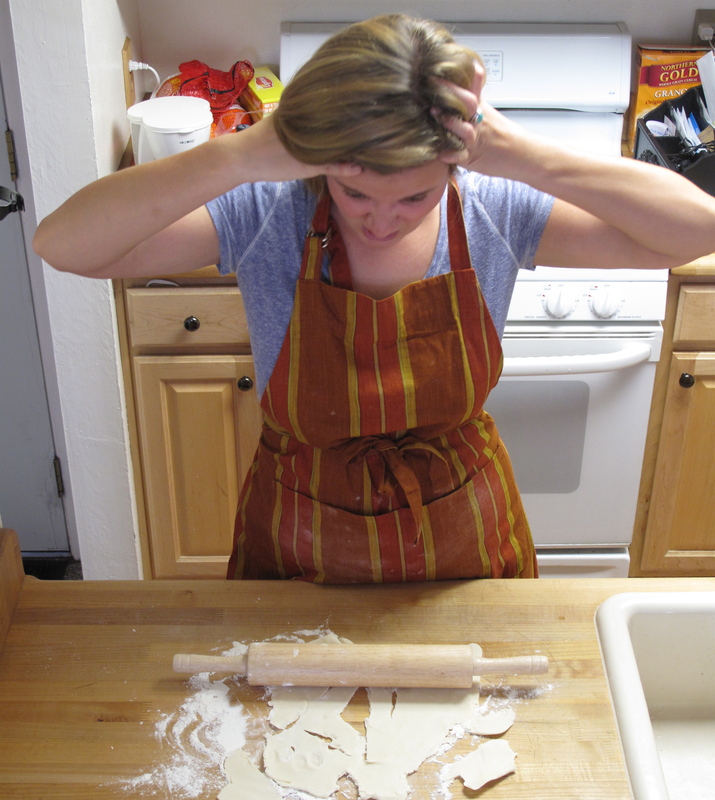 The source of their anguish: their dough cracks and falls apart. And since I’m a guy – and guys like to fix things – I made this 2-part video about the 5 things you can do to help avoid this problem. I pray it helps. I’ve outlined those five things here, in broad strokes. But I still encourage you to watch both parts of the video if you sometimes find yourself in a similar situation. And even if you don’t, you might learn a trick or two in the process. At the very least, you won’t want to miss the cameo appearance by my friend Clint Eastwood in the video. In addition to these tips, the recipe below is specially designed for those of you who have had cracking pie dough problems in the past. It’s pretty similar to many other doughs, only this one has a bit more fat in it so you’ll probably find it a little easier to work with, handle, and roll. Try it and see. You have the option of making it with all butter or – the way I like it best – mostly butter, but with some Crisco to tenderize the dough. Your choice. Just be aware that an all-butter crust will be firmer – a little stiffer – than one made with even a small amount of Crisco. So it takes a bit more muscle to roll out an all butter dough. Here then, in brief, are the 5 things you can do to help prevent your pie dough from cracking. 1. Make sure you cut the fat in enough. From the emails I receive, I get the feeling that many bakers don’t do this – they stop short of thorough cutting for fear of toughening the dough. (Which you really don’t have to worry about until you add the water.) In the video, I show you how far to go and what your mixture will look like when you’re ready to add the water. 2. Add the water all at once. I know – you’re terrified of this step because this adding the water business, in your mind, is surrounded by yellow caution tape like a crime scene on CSI. I used to be the same way too. Time to get over that and I’ll show you how. You’re going to take a bold step forward in this regard. 3. Knead the dough once. Okay, maybe twice. The idea is to work out any kinks, compress it, and take the first step toward shaping it into a workable disk that’s our starting point for rolling. 4. 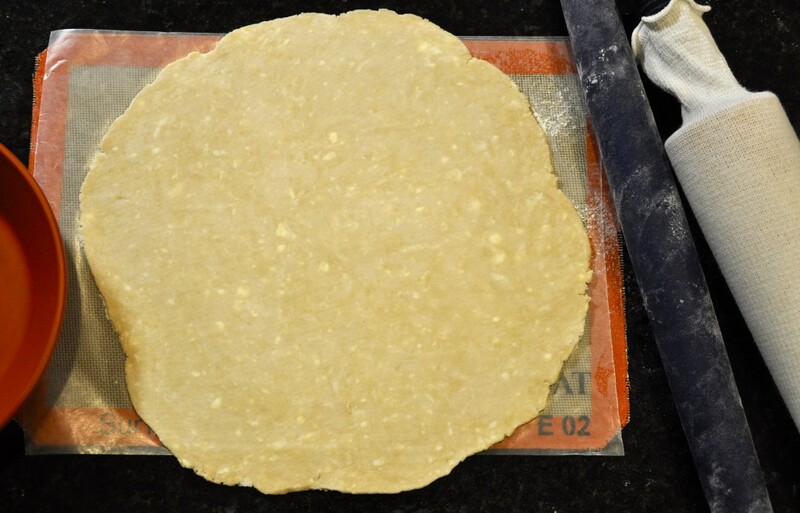 Put the dough in a plastic freezer bag and roll it out to about 8 inches in diameter. In the past, I’ve usually just put the disk in the fridge – without this little pre-roll – but I really think this initial roll, prior to refrigerating the dough, helps quite a bit for reasons I explain in the video. 5. Finally, once you’re chilled the dough for an hour or two, remove it from the fridge, take it out of the bag and let it rest for 5 minutes, then finish rolling. This brief rest at room temperature keeps you from fighting with a dough that’s too cold. And remember that cold dough likes to wake slowly, so don’t go pounding on the thing straight away. Wake it up with a few gentle love rolls first. I’ll show you how in part 2 of this video. Enjoy the video, good luck, and – while these techniques can be applied to almost any pie dough you make by hand – here’s a good dough to start with if you’ve had cracking problems in the past. It has a little more fat than usual – something that will favor anyone who has experienced tough crusts. The recipe yields enough pastry for a 9- to 9 1/2-inch deep-dish pie shell. If you need a top crust also, I highly recommend that you make it twice – rather than doubling the recipe – for best results. Before you do anything else, put the butter cubes on a plate and put the plate in the refrigerator for 10 minutes. If you're using the butter AND shortening, put them on the plate in separate areas. Combine the flour, sugar, and salt in a large mixing bowl. Whisk to mix. Add the butter - but if you're using the shortening, too, don't add it yet - and toss the butter with the flour to coat everything. Using a pastry blender, start cutting in the fat until you have an assortment of fairly large chunks. You'll need to clean off the blades of the pastry blender from time to time as the clumps build up. If you're using the Crisco, add it now, after this initial breaking up of the fat. Toss by hand, like you did with the butter, to coat. In either case, continue to cut in the fat - cleaning off the blades regularly - until the fat is well distributed and you have much smaller but still random size pieces in your mixture, as shown in the video. Everything should look like it has been "touched" by the fat. Pour the ice cold water over the mixture - don't dump it in one place, rather, spread it around. Using a large fork, lightly stir the mixture to moisten the whole thing. Don't press down on the mixture quite yet; just stir briskly to spread the moisture around. Before long, the mixture should start forming larger and larger clumps. When this starts to happen, stop stirring, flour your hands, and pack the dough together. Put the dough on your floured work surface and knead it once or twice, shaping it into a disk about 3/4-inch thick. Flour the disk, place it in the center of a gallon freezer storage bag, and roll it gently - right in the bag - to make a disk 8-inches in diameter. Seal the bag and refrigerate for 1 to 2 hours.